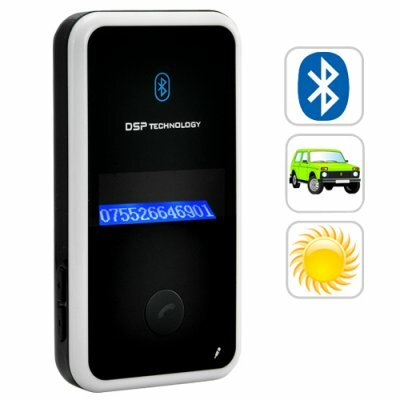 Successfully Added Solar Powered Bluetooth Car Kit (Caller ID) to your Shopping Cart. Solar Powered Bluetooth Car Kit with caller ID and built-in microphone and speaker. Brought to you in a stylish form factor, this solar powered Bluetooth car kit is designed with your personal convenience and safety in mind. Utilizing Bluetooth 2.0 wireless technology, this handsfree device is perfect for anyone who wants to safely use their cellphone while driving. Simply stick it on the vehicle's windshield, or even clip it onto the sun visor, for the safest and most convenient way to talk and drive. This solar powered Bluetooth car kit also comes with a solar panel that will charge the device automatically. Thanks to the transparent holder and suction cups, you can leave it on the windshield to receive maximum sunlight so you'll never have to recharge or even move the device, how convenient! For those cloudy days, you can also power the Bluetooth car kit directly through the car's cigarette lighter socket or by USB. With Bluetooth 2.0 technology, simply pair up your cell phone with this solar powered Bluetooth car kit. For handsfree operation and safe driving, this versatile device has a built-in speaker and microphone. Caller ID will appear on the unit's LCD display to clearly show both the incoming call number and caller name for maximum convenience. A host of powerful call management features provide you with the flexibility to answer and end calls, reject calls, call waiting function, voice dial and redial. Phonebook support is also provided, along with callback, ensuring that you never miss an important call. If you don't want to miss out on that business deal, but also don't want to divide your attention while driving, then this solar powered Bluetooth car kit is for you. This device reduces traffic accidents by providing you the the safest and easiest way to make and receive calls while driving. Order now and we'll ship it out tomorrow along with our famous 12 month guarantee. Brought to you by the leader in China Electronics - Chinavasion.